When Lucy Morland realised she had to complete 100 hours of practical practice in order to complete her Reflexology course she decided to send an email offering Reflexology sessions for free to staff at a local Care organisation. Within a week she had 5 people signed up. Lucy was able to gain experience and provide the staff there a great service for which they were extremely grateful. In fact, so grateful, that they paid Lucy to do taster sessions to people at a fair they had organised. 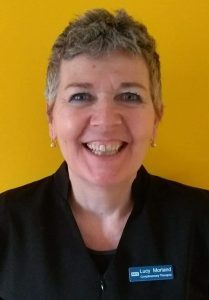 After completing her Reflexology course at Richdales, Lucy volunteered her services at a cancer support centre and went on to meet a contact who offered her full-time work as a therapist. Lucy’s journey from teaching anthropology at a college, to caring for her sick parents and now to being a full time therapist is inspiring. It also demonstrates how volunteering can offer so many benefits. Listen to Lucy’s story of what first triggered her interest in learning about Reflexology, how she found Richdales and her journey from being a student to working full-time in this field. This entry was posted in London Graduates and tagged Lucy Morland, reflexology course, richdales, volunteering. Bookmark the permalink.